Leahi Hospital held a program honoring its oldest patients yesterday in conjunction with National Nursing Home Week. 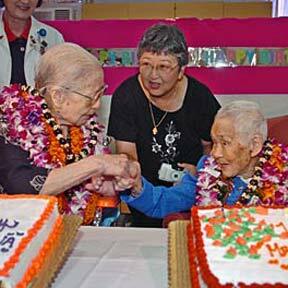 The two oldest residents are Fujie Hasegawa, 101 this month, left, and Eunice Kim, 104. Between them is Dorothy Watanabe, Hasegawa's 71-year-old daughter.